The government of Northwest China's Shaanxi Province has developed a plan to solve the problem of illegal villas and environment damage in the Qinling Mountains before June and fully restore the mountains' environment by 2020. The move comes a month after China Central Television aired a documentary on January 9 about a group of local Shaanxi officials who were punished for failing to demolish a large number of illegal villas, which undermined the local environment, in the Qinling Mountains despite repeated orders from Chinese President Xi Jinping, also general secretary of the Communist Party of China Central Committee. 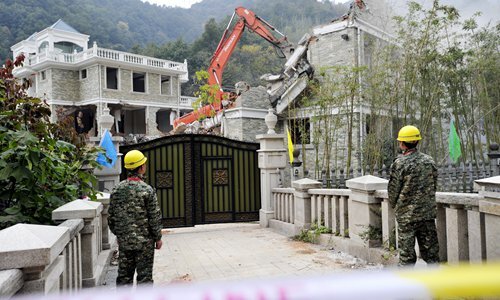 The Shaanxi government vowed to completely solve a series of problems, including illegal villas, deforestation and illegal hunting by June, according to a document posted on its WeChat account on Thursday. By the end of 2020, mining will be restricted - and even forbidden - in the development zone in the Qinling Mountains, mine rehabilitation will be gradually promoted. Management of religious venues, tourist sites and the farm tourism business will also be enhanced, the document said. The plan said that the Shaanxi government will focus on environmental protection work in six cities located around the Qinling Mountains, including Xi'an, the provincial capital. The government will assign special work teams to the six cities to monitor illegal buildings, excessive deforestation, illegal emissions and illegal hunting. The Ministry of Natural Resources and Ministry of Ecology and Environment of Shaanxi Province will work with other departments to comprehensively review the work to prevent a repeat of illegal behavior. The size of Shaanxi's forest will reach 500 million cubic meters by 2020, and the forest coverage rate of the province will reach 45 percent, the Xinhua News Agency reported in January, citing Shaanxi forestry bureau.